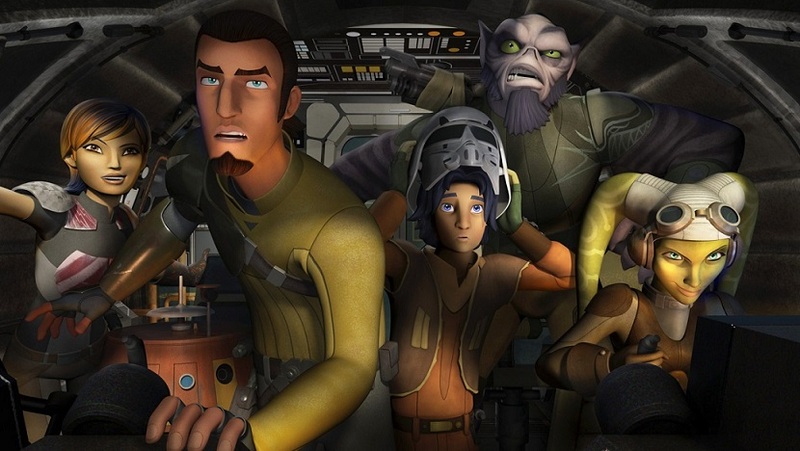 After watching the season one finale of Star Wars Rebels the night it first aired, I commented on social media that the series had become some of the very best Star Wars storytelling in any medium. Now that a few weeks have passed to reflect on the show, my opinion hasn’t changed. Whether it’s the novels or comics, The Clone Wars or even the movies, I’d hold up Rebels with any of them. On every level, Rebels “gets” what Star Wars can be, and should be, with a consistency that most Star Wars stories to date have been unable to sustain. With so much more Star Wars storytelling coming in the years ahead, Rebels sets a very high bar of quality for others to aspire to meet. The core of Star Wars is its characters, and Rebels introduces a new band of heroes and adversaries for fans to experience. Like Luke in the Original Trilogy, particularly A New Hope, Ezra is the character who undertakes the steps of a Campbellian Hero’s Journey with allies and friends in his orbit. The series premiere takes him through the early stages, including the call to adventure when meeting the Ghost crew, his initial refusal of the call, finding a supernatural mentor in Kanan, and enduring the “belly of the whale” when captured by Agent Kallus. In subsequent episodes he experiences the “magic flight” of his first trip into space and “wears the enemy’s skin” by going undercover in stormtrooper trainee gear in the Imperial academy. Mirroring Luke’s failure in the cave on Dagobah, Ezra touches the dark side in the cave on Fort Anaxes when his fears with Kanan, the Inquistor, and the fyrnocks overwhelm him. But Rebels does not hew to Campbell too closely. The “temptress” in Ezra’s journey is not a goddess or girl, but rather Senator Gall Travyis, whose duplicity fools Ezra but fortunately not Hera. Like Anakin and Luke before him, Ezra must grow past his less enviable traits. 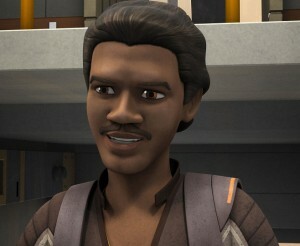 He doesn’t always make the right choices, especially early in the season, but ultimately he is a good person with good motivations: he wants to become a Jedi because he wants to protect people. The rest of the Ghost crew are equally well designed and developed. Hera is the ship’s captain and leader of their rebel cause. She is committed and loyal, but not without her own flaws. She too wanted to believe Travyis was on their side, and nearly didn’t see the truth in time, and she risks the existence of their cell of the Rebellion to rescue Kanan, against Fulcrum’s instructions. In many ways Kanan has confidence, strength, and leadership too – until it comes to Ezra and his obligation to train the teenager. Then Kanan’s self-doubt and uncertainty come to the fore, giving the elder character his own path of growth and struggles to face. Throughout the series Rebels consistently gives Sabine agency in the stories, from playing crucial roles in combat or rescue mission to technical expertise that can save the day. Yet she is also a teenager, and sometimes makes rash or impertinent decisions appropriate to her still-developing maturity. It takes a hard-earned lesson for Sabine to understand she can trust Hera despite the secrecy, and that growth pays off in later episodes. Zeb has less of a story arc in season one, though we do learn of his motivation for fighting the Empire after what happened to his homeworld, and it is fun to watch his change of heart from his first reactions to Ezra to his fondness for the kid by season’s end. 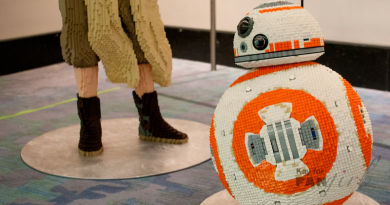 Even the astromech droid Chopper has a memorable personality. His pranks toward and moments of frustration with the sentients provide great comedic relief, as does his sheer lack of concern for the welfare of other droids. Yet Chopper also cares about his fellow crew members, mourning Kanan after his capture and quickly joining a plan to save him. Few Star Wars stories create, develop, and consistently portray a cast of characters as successfully as Rebels does with the crew of the Ghost. Great characters are important, but they aren’t enough to lift a story to greatness, too. Other elements of storytelling also matter; in Star Wars, some tales fall short in tone, themes, or use of lore. Rebels, though, doesn’t suffer from any of those flaws. Star Wars is writ large across a galactic scale, and there’s room in Star Wars storytelling for a wide variety of tones. In the Legends tales, for example, no one would mistake Shatterpoint or Traitor for Starfighters of Adumar, even though those novels consistently make fans’ favorite-books lists. The fact that Star Wars is big enough to include everything from serious dramatic storytelling to LEGO Star Wars farces gives storytellers a lot of room to work. At the same time, though, when it comes to the core stories of the principal characters, fans have certain expectations – including a tone largely consistent with the films. Rebels rises to the challenge. The series has moments of intensity without becoming grim or gritty; it includes several literally laugh-out-loud funny scenes without losing the seriousness of the stakes of a small cell of insurgents trying to spark an uprising against a dominating Empire. The protagonists have their share of sharp emotional clashes, but they also sling banter worthy of the best zingers in The Empire Strikes Back. The heroes face no easy wins, but the tone of Rebels never loses its underlying sense of fun, optimism, and hope. Star Wars suffered over the previous decade when storytellers lost touch with that tone; hopefully the upcoming tales will stay true to it. Rebels also succeeds at drawing upon the themes of Star Wars in familiar ways, while also telling an original story with them. Any story about Jedi and the Force, of course, has to deal with the theme of light and dark. Kanan must face the reality that he has fled from his true self for many years, and has made some morally problematic compromises along the way. To become the kind of Jedi mentor Ezra needs, he must re-learn to follow the Jedi way. For his part, the pupil confronts the difficult prospect of un-learning some of the values, particularly variations on the ends justifying the means, that served him well in an orphan’s hardscrabble existence but which don’t lead down the right path once the power of the Force comes into play. Dealing with unsavory figures like Vizago and Lando only complicates the balance they must learn to strike. But the two Jedi are not the only characters who must make tough choices. 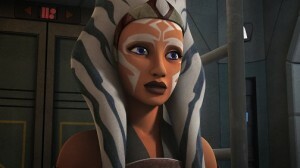 Hera deliberately conceals information from her crew, even Kanan, in the best interests of the rebellion. Sabine disobeys orders when she thinks she’s right, creating risks to the team in the process. Choosing between light and dark, right and wrong, cuts to the very core of Star Wars, and Rebels weaves those themes into the series to great effect. Even with the specific details of the erstwhile Expanded Universe galaxy now sequestered into the Legends tales, Star Wars still contains an incredible amount of lore. Following the movies’ tradition of in media res storytelling, Rebels includes its fair share of namedrops to individuals, planets, and other lore facts. But it does not dwell on them, or feel the need to explain them; instead, it leaves their meaning to the audience’s imagination. What did Sabine experience at the Imperial academy on Mandalore? How did Zeb manage to escape the massacre on Lasat? Fans more immersed in Legends lore may wonder how much the Rebels version of Inquisitors, or the Imperial Security Bureau, or Base Delta Zero resembles the former versions, while new fans simply can enjoy the immersion in a richly developed galaxy. 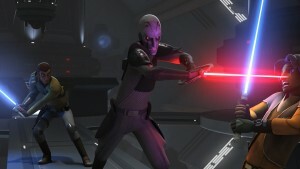 Just as the younglings on Ilum in The Clone Wars had to overcome their fears to earn their lightsaber crystals, so too Ezra must find his courage to earn his – but Rebels rightly has no need to mention Ilum or Master Huyang or the old ways; the parallel to the lore is sufficient, without making the connections explicit. Likewise, fans who have watched the Yoda arc in the Lost Missions will understand the significance of the “fireflies” that appear to Ezra when he speaks to Yoda within the Lothal temple, but nothing more needs to be said about the mystical lights in Rebels itself. In the past, many Star Wars storytellers gave the impression that they were engaged in a contest to see who could create the most new lore, or retcon the most supposed continuity errors, or reference the most preexisting factoids; too often, lore came first and story came second. In this new era of Star Wars storytelling, hopefully the priorities will be corrected – and Rebels is certainly a good sign. A great story comes not only from getting the big picture right, but also in the details. Here again, Rebels succeeds. The episodes make numerous interconnections to add depth to the characters’ adventure. The premiere references Tarkin Town long before the Moff ever appears onscreen. Ezra’s goofy fake name in captivity cycles back when Agent Kallus sarcastically greets “Padawan Jabba” when the crew is surrounded. 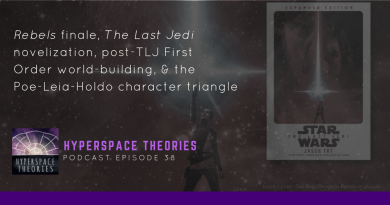 The TIE Fighter stolen by Ezra and Zeb initially seems to be merely a MacGuffin for building a bond between the grumpy old brother and the new young interloper to the family – until its colorfully triumphant return as a key component to the rescue mission. This is great storytelling, no matter the galaxy. Rebels gets its Star Wars details right, too. The homages to the movies are recognizable without becoming heavy-handed. Some, like Zeb atop the AT-DP and the duel on the catwalks, resemble the films quite closely. Others, like the solemn Ghost crew after Kanan’s capture or Ezra’s vision of Senator Trayvis, remind us of moments like Han’s absence at the end of The Empire Strikes Back or Luke’s and Anakin’s visions in Empire, Attack of the Clones, and Revenge of the Sith without mirroring them overtly. Rebels has the most fun, though, when it puts its own twist on the homage. It is Ezra – the equivalent to Luke, not Leia – who sits imprisoned in an Imperial cell awaiting liberation early in the series. Later it is Kanan, not a princess or other female character, whom the crew must rescue from Tarkin’s Star Destroyer. The Moff must evacuate his imploding warship, adding a new motivation for his arrogant (and fatal) refusal to leave the Death Star at the end of A New Hope. 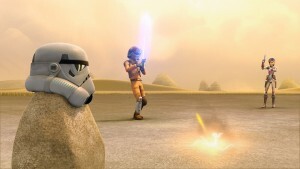 During his initial lightsaber training, Ezra faces not a simple training remote, but his friends ganged up to shoot at him. The first season finale ends with a juxtaposition of incredible thematic significance to Star Wars. The Ghost crew finally meets the mysterious Fulcrum, and the audience learns she is Ahsoka Tano, heroine of The Clone Wars and former apprentice to Anakin Skywalker. 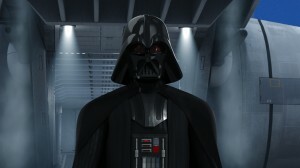 The next scene cuts to Tarkin’s return to Lothal, where he informs Agent Kallus that no less than Darth Vader himself has arrived to deal with their rebel problem. As I mentioned in the most recent episode of Hyperspace Theories, a decade ago fanficcers imagined countless variations on a showdown between Darth Vader and Padmé Amidala. Many of them envisioned Padmé surviving the birth of the twins and playing a leading role in the Rebellion from exile, often in hiding on Alderaan, before facing Vader again years later. In the canon, of course, this will not come to pass. But now Rebels has set up the potential for a confrontation equally as powerful emotionally. As Fulcrum, Ahsoka is a pivotal force in the incipient Rebellion. During her apprenticeship, her Mast er was the one who suggested training Onderon locals to overthrow the Separatist occupation, providing Ahsoka with her first experience at insurrection against tyranny. As we know from A New Hope, one of Vader’s primary assignments is to crush the Rebellion, including pursuit of its leaders like Princess Leia Organa. The circle between Kenobi and Vader is completed by their fateful duel on the Death Star. The circle between Ahsoka and Anakin, Fulcrum and Vader, is now open before us, waiting to be drawn. I can’t wait to see where Rebels takes us next. #6 on my list of Reasons for Epic Sadness Over Missing Celebration…the Art Show! I agree, Star Wars Rebels is superb! I have watched the first season recently and I was astonished before the thrilling episodes and the interesting characters. The three last episodes of the season one are pure gold, they are very well done and the plot turns out very thrilling. I love the visual design, the colors, the use of the music and the voice acting. I think this is one of the best series of Star Wars ever created. I hope the quality keeps up in the next seasons. Good article, by the way, I like so much!